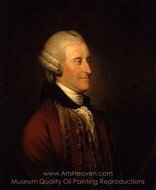 Johann Zoffany was a German neoclassical painter, active mainly in England. His works appear in many prominent British national galleries such as the National Gallery, London and the Tate Gallery and in the Royal Collection. 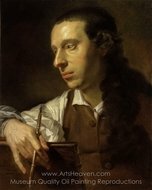 Zoffany was born in Frankfurt. 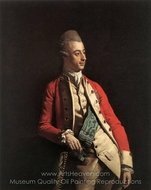 He came to Britain to enjoy the patronage of the royal family. 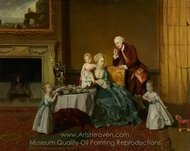 Zoffany was favoured by British King George III and Queen Charlotte, painting them in charmingly informal scenes � including one, "Queen Charlotte and Her Two Eldest Children" (1765), in which the queen is shown with her eldest children seated at her toilette at Buckingham House, and another, outdoors, with her children and her brothers. 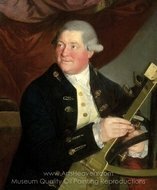 Johann Zoffany was known for being very arrogant with his art. He had been known to have an outstanding argument with many artists, he would often draw caricatures of other artists he did not like in his art. 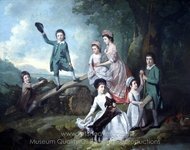 "It is the best designed of all Zoffany's works and in the minute imitation of nature...it is unexcelled." 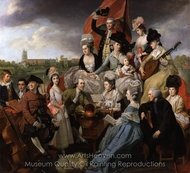 In the later part of his life, Zoffany became especially noted for producing huge paintings with large casts of people and objets d'art, all readily recognizable. 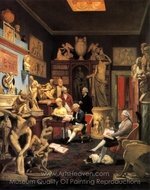 In paintings like "The Tribuna of the Uffizi," he carried this extreme fidelity beyond clutter, almost to mania - the Tribuna was already displayed 18th century display, but Zoffany had other works brought in from elsewhere in the Uffizi. He remained in Britain, and died at Strand-on-the-Green.